A lot of you might have seen this but if not, it puts my bike lane ranting in the shade! On Saturday, just outside Lusk, Co. Dublin, a group of us were stopped beside the road, waiting for one of our colleagues to replace a punctured tube, when a man passed us on his morning walk. "Ah lads, would ye not save up and buy yourselves a bus." I went out training with Ian Gallahars club, Dublin Wheelers, today. They always stop at the same cafe in Ashbourne. This morning the owner announced that Ian had given her €50 three weeks ago to buy teas and coffees for the group the following Saturday. For various reasons she wasn't there for the last few weekends so today was the first opportunity she'd had to spread his generosity, 4 days after his sudden death. Almost everyone in the cafe knew Ian from his long and dedicated service to the sport. As you can imagine it was a poignant moment. We all raised our mugs to a decent man before heading back out on roads he'd ridden so often, and so recently, himself. 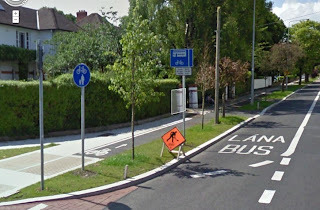 According to the signs there is an off road cycle track, shared with pedestrians, but the other sign says the bus lane is also for bikes. So was I within my rights riding in the bus lane or does the very presence of a dedicated bike path mean I HAVE to ride in it? But then again, that isn't a dedicated bike lane, it's a footpath/bike lane so which one takes priority?